Αξιολόγηση και διδασκαλία Online, βάση δεδομένων ασκήσεων και ύλης, ανάθεση εργασιών,κατατακτήριες εξετάσεις κ.α. 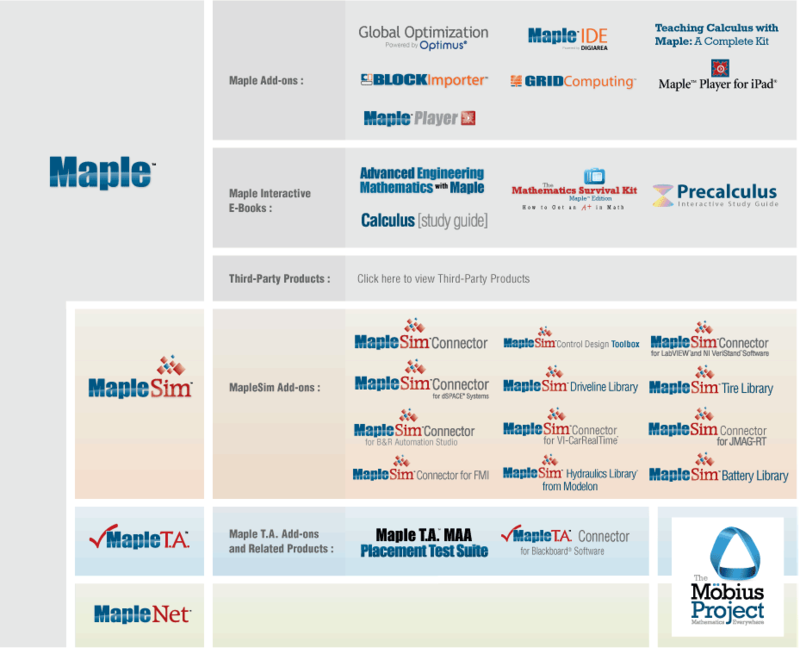 Maplesoft™ is the leading provider of high-performance software tools for engineering, science, and mathematics. Maple is the essential technical computing software for today’s engineers, mathematicians, and scientists. Whether you need to do quick calculations, develop design sheets, teach fundamental concepts, or produce sophisticated high-fidelity simulation models, Maple’s world-leading computation engine offers the breadth, depth, and performance to handle every type of mathematics. Information about Maple's product history. MapleSim is a physical modeling tool unlike any other. MapleSim is built on a foundation of symbolic computation technology, which efficiently manages all of the complex mathematics involved in the development of engineering system models, including multi-domain systems and plant models for control applications. Maplesoft offers a suite of products designed for online placement testing, homework delivery, drill and practice, exam questions and assignments, high stakes testing, standards and gateway testing, and “just in time” teaching. The Möbius project is the biggest academic initiative in Maplesoft’s 25 year history! Create math apps, share them with everyone, and grade them to assess understanding. MapleNet offers a suite of mathematical services that let you use Maple in interactive web and desktop applications, share solutions over the web through interactive Maple documents, and develop rich technical web content. A wealth of products are available from Maplesoft and third-party developers and organizations to augment Maplesoft’s suite of tools. Maplesoft’s Professional Services can help you implement your modeling and simulation strategy in a timely and cost effective way. Our team of highly experienced engineers, mathematicians, and computing experts are the ideal complement to your team.